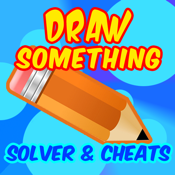 Solver & Cheats for Draw Something will solve the answers to the hardest drawings your friends can draw! Using this app, you will never have to pass again! To find the correct words, simply open up this app, type in your given set of letters and the length of the correct word, and the app will intelligently list all the possible answers. Draw Something will help you get every answer. ◆ Incredibly easy to use, simply enter the letters you are given and the word length, that's it. ◆ No internet connection required. Use this app whenever you want.